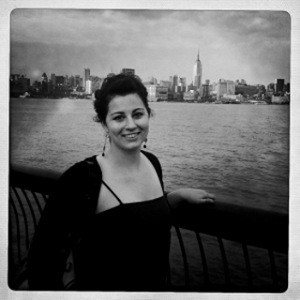 Today, I want to talk about the latest issue of Lonny. 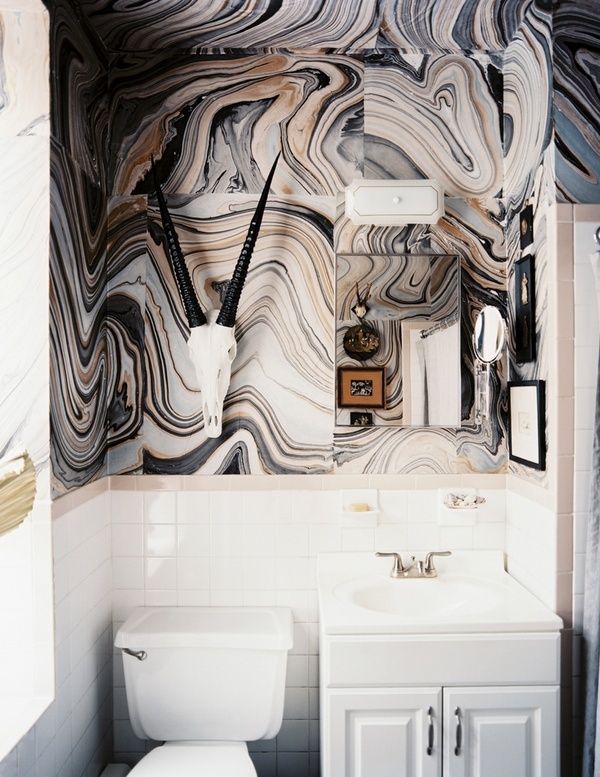 Specifically this marbled paper bathroom by Nicki Clendening. Now, as you know, I don't typically break down Lonny, or any magazine really. I figure enough people do that, and for me to do it, well, would just be redundant. I am not really about redundancy 'round here. However, I do feel this space deserves a little pub and I'm gonna give it. I have actually seen others' critiques of this tiny bathroom with a punch, and was crazy surprised, that they were as mixed as they were. This space was far and away, the one that made the biggest impression on me (although most of the other features in August's issue were pretty strong too.) But, this...this was just brilliance. Yes, I know, cheap Home Depot vanity, light, and mirror (the complaints I read elsewhere.) But, people, it's a rental (if I remember right.) You can't just go ripping out vanities and mirrors when your renting. You can however, do the best with what you have. And boy, did Nicki deliver. I actually even like the fact that the paper doesn't match up. It reminds me of one of those decorative boxes covered in tiles of marble, or bone, or whatever. It give such a lovely effect. It is definitely making me want to literally do the exact same thing to my bath. I'm all about originality, but I'd be willing to be a copycat in this case. So what are your thoughts? Does it strike you the same way as it does me? Or, are you one the the peeps that just doesn't feel it? If I weren't trying to sell my house in the next year, I'd totally steal that idea. Now that I know it's a rental (I didn't read the article), I'll definitely cut that big box vanity some slack. Blown away. I loved it as much as u did. So much so I never saw passed the wallpaper to see the ugly vanity/mirror. When I first saw the room, my jaw dropped. I can appreciate a room that makes you say, "WOW!" Yes, it would have been nice if some other elements could have been changed but the walls are so stunning that it makes up for it. Totally agree with you! I saw it and LOVED it, and immediately set off to find paper similar because I have been looking for something new and exciting to do in my entryway and the colours in this paper is bang on for me. 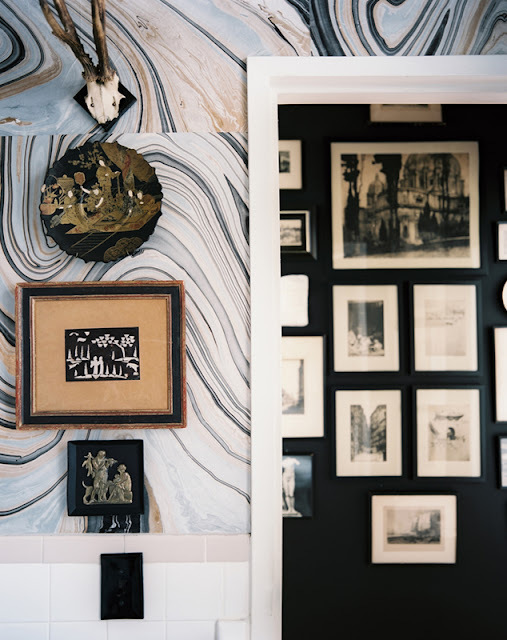 I do find it a tad annoying that the paper doesn't match up - although I think it looks great here, its what held me back from immediately buying paper and plastering it on my entryway walls...I think it would bug me, and might even be too much floor to ceiling? I LOVE LOVE LOVED this, too! Haven't read critiques around the land, but just as surprised that this would take heat. I thought this was the best issue of Lonny in a long long time, and I have to say, I appreciate that they--like Domino before them--are not afraid to show a "rea;" bathroom (the vanity, etc.) that has been made fabulous by a little ingenuity. That it is not only about having the money, but also having VISION! I too love it, but wonder how it does with moisture, etc. Oh I definitely feel it! im also annoyed at paper that doesnt match up. I had that happen to me when i bought a specific paper for my current place, luckily it was black. Anyhow this is brilliant- i almost died when i saw this- LOVE it.